A beard trimmer is a small machine with many small components. The trimmer needs to stay lubricated at all times, whether it is on or off because the components need to stay lubricated in order to move and function. Therefore, beard trimmers need regular maintenance to continue working well. Apart from being cleaned after every use, it also needs to be oiled. You don’t need to wait until your machines starts acting up like rusting, getting discolored, having strange tones, heating up and showing other signs before acting. It may be too late, and you may have to replace it after all. The good news is that first and foremost, it is an easy habit to learn and keep. And two, the package of a quality beard trimmer usually as a complete grooming kit. Therefore you are saved the hassle of buying all the tools and products of keeping it in good shape. The package usually includes a little bottle of lubrication oil. Oiling your trimmer rightly will maintain them in the best condition, on top of preserving your bottle of oil. Because you definitely want your bottle of lubrication oil to last you the longest time possible. The container can last over six months if used as recommended. If not lubricated the components of the beard trimmer get prone to rust and will eventually malfunction. In addition, when a trimmer is not oiled, it is more painful to shave with it. Can you use any oil to lubricate the beard trimmer? If you use any oil, it is at your own risk of spoiling your gadget. Stick to beard trimmer lubricating oils which are designed for oiling tiny components. These oils are thin in nature. The oil is supposed to get into all the small movable parts. Therefore thin oil is required. Other oils may ruin the trimmer. They were made for large mechanical parts and have a heavy viscosity. Also, avoid vegetable oils like extra virgin olive oil or other oils. The oils will destroy your trimmer. A good shaver will come as a full beard grooming kit. It includes the beard trimmer, a user manual, a tiny cleaning brush, and lubricating oil. However, if your trimmer did not come as a package or you misplaced them, not to worry. Start by reading the user manual well. Also if the manufacturer has a warranty on your trimmer, understand the warranty, the warranty period and what products can be used in the trimmer during the warranty period. Using a wrong oil will not only damage the trimmer but may also void the warranty. You need the proper oil. Buy a bottle of lubricating oil from a trusted manufacturer of beard trimmers. Also, check out local or online stores that offer men’s grooming products. You can use any oil for lubricating small mechanical parts or razor-lubricating oil. Then you can use a clean toothbrush as an alternative to a small brush. Use the oil conservatively. 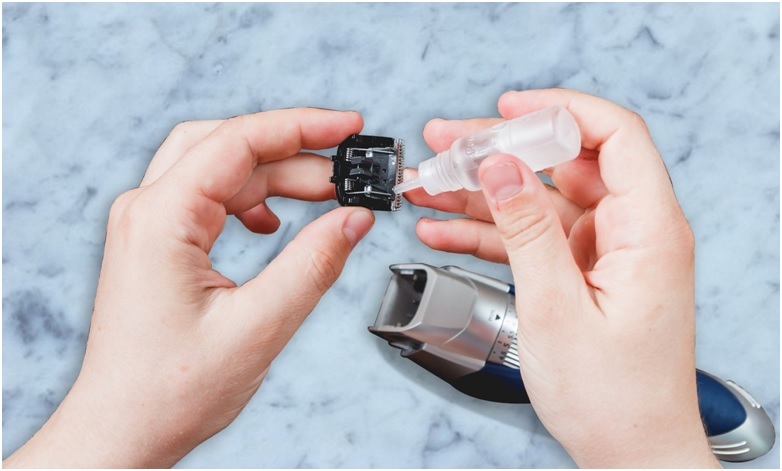 After all, you only need a little every time you lubricate your trimmer components.
. You cannot lubricate a dirty trimmer with clogged hair in it, the hair in the device will prevent the oil from reaching and lubricating the parts. One of the main reasons for cleaning a trimmer is so that it can get lubricated well. Therefore, cleaning of your trimmer should be done after every shave followed by lubrication of the device. If the device is not cleaned after a use, it will eventually malfunction due to lack of lubrication. Therefore, never oil a dirty trimmer. Start by cleaning it if it is not clean. Use a small brush or unused toothbrush to clean the components first. Start by first switching off your device. The oil should be in a good bottle with a good f dispenser to dispense small drops. The parts only need one to two drops to stay lubricated. The main aim of lubricating a trimmer is to lubricate the blades and other metallic parts. Lubricate the trimmer. Then turn the trimmer on for about 30 seconds to allow the oil to penetrate in the components well. Then switch it off. Wipe excess oil with a piece of cloth. Be sure to keep all your tools and grooming products in a kit. Then store them well in a cool, dry place. You do not want to look for any item, be it brush, oil, blade guards or the trimmer itself when you need it. Should you stay without using your trimmer for long, a period exceeding four weeks, then you will need to keep oiling it. Chances are very high that the components have lost lubrication.